The Sony A77 is a big leap forward for Sony's DSLR range, offering a feature-set, handling and performance that beats its main rivals. The new 24.3 megapixel sensor offers greatly increased resolution without impacting on low-light performance or operational speed, while the OLED viewfinder is simply the best EVF that we've ever had the pleasure of using. The inclusion of full 1080p movies, built-in GPS, 12fps burst shooting, dual control dials, top-panel LCD and an excellent 3-way rear screen make the A77 our new favourite prosumer DSLR. As it shares the same sensor with the A65, image quality is also excellent, with results from the 24.3 APS-C sensor easily rivalling the DSLR competition. Noise doesn't rear its ugly head until ISO 3200 for JPEGs and even the faster settings prove eminently usable, although the A77 does apply some pretty aggressive noise reduction to keep the files clean as shown by the much noisier RAW images. The myriad of creative effects such as HDR, Dynamic Range Optimisation, creative styles, picture effects and the innovative sweep panorama mode help to get the most out of the A77. 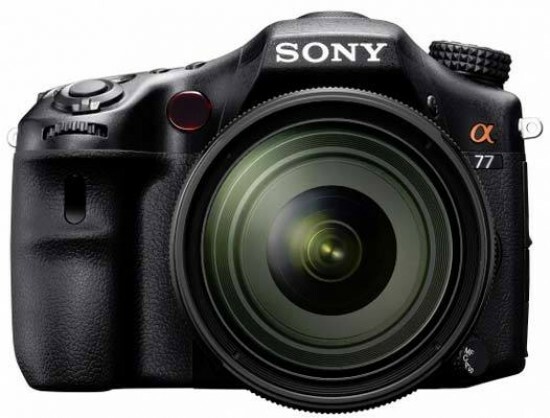 As with its SLT predecessors, the A77's translucent mirror and EVF combination open up a world of possibilities for Sony, with headline grabbing burst shooting speeds, fast auto-focus for both stills and video, barely any shutter lag to speak of, and 100% scene coverage. There are some limitations of this ambitious design, most notably the almost complete inability to pan with your subject and rather noticeable jumps in focus if using continuous auto-focus during video recording, but overall the new A77 feels more mature and well-rounded than the first generation. Compared to the cheaper A65 model, the bigger, magnesium-bodied A77 is clearly designed to appeal to the enthusiast who wants all the bells and whistles. It therefore has a magnesium-alloy body with weather-sealed controls, two control dials, faster 12fps burst mode, a 3-way swiveling LCD screen, useful top LCD panel, 19-point autofocus with more cross-sensors, a flash sync socket, and an optional vertical grip. But if you can live without those features and want to pocket the rather substantial cash saving instead, the A65 is still a fantastic and crucially cheaper alternative. Having said that, we'd definitely splash the extra cash and choose the A77 every time. It offers enough upgrades over the A65 to tempt us, and crucially it out-performs the direct competition too. At a time when compact system cameras are the centre of attention, it's great to see some real innovation in the DSLR world, and for that innovation to result in a truly exceptional camera like the new Sony A77.